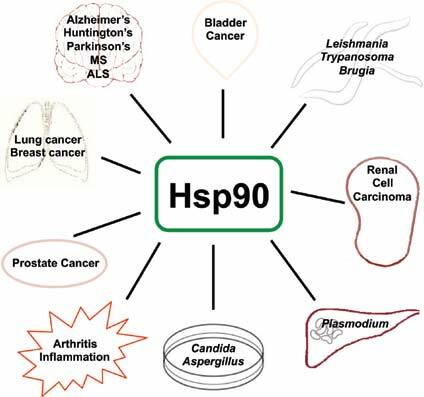 Heat shock protein–90 (Hsp90) is a molecular chaperone critical to the folding, stability and activity of over 200 client proteins including many responsible for tumor initiation, progression and metastasis. Hsp90 chaperone function is linked to its ATPase activity and Hsp90 inhibitors interfere with this activity, thereby making Hsp90 an attractive target for cancer therapy. Also post-translational modification (PTM) and co-chaperone proteins modulate Hsp90 function, providing additional targets for secondary inhibition. Recent reports have shown that pathogens utilize both their own Hsp90 and that of their host for the propagation of infectious elements. In this review we will summarize our current knowledge of Hsp90 structure and function in both the pathogen and the host. We will focus on the role of Hsp90 in viral and parasitic diseases and the potential beneficial application of Hsp90 inhibitors alone and in combination with disease-specific inhibitors. Heat shock protein 90, Molecular Chaperones, Co-chaperone, Combination therapy, Hsp90, Pathogens, Posttranslational modification. Department of Urology; Cancer Research Institute; Department of Biochemistry and Molecular Biology, SUNY Upstate Medical University, 750 E. Adams St., Syracuse, NY 13210, USA.